Arrive Incheon International Airport and transfer to the hotel where the remainder of the day will be free at leisure. Breakfast at hotel. Half day sightseeing tour : Pass-by Cheongwadae (Presidential residence), visit the Gyeongbok Palace, the oldest and grandest of Seoul’s royal palaces, a masterpiece of Korean traditional architecture and one of Seoul’s most visited locations. 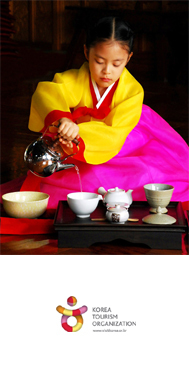 National Folkore Museum exhibiting the religious rituals, customs, food and social dynamics of traditional Korean Life. Jogye Temple is chief temple of the Jogye order which represents the Korean Buddhism. Continue to Insadong Antique street and visit major galleries, enjoy free shopping. Mid afternoon flight from Gimpo Airport to Busan Airport. Upon arrival, you will be met by our representative and transfer to hotel. Hotel check in and free time. Breakfast at the hotel. Visit *Yongdusan park - considered a favorite resting place among the citizens. Passing by *Jagalchi fishery market, Korea's largest seafood market fomed after Korean War, representaing the life style of the indigenous Busan native. You can eat fresh raw fish right at the market where all kind of fishes are on display in ice or in the aquariums for sale. And transfer to *Gyeongju, an ancient capital of Silla Dynasty (BC57~AD935) and a museum without walls by bus or van (one and a half hour drive). Visit *BulguksaTemple built during the most glorious period of the Dynasty. The temple is one of the most frequently mentioned and the best known temple in Korea. Teh architectural design of the temple is one the constrained dignity, peace and harmony and the temple still remains as one of the remarkable achievements of the ancient Far East region. And then Transfer to *Seogulram Gotto - the home of serene stone Buddha of the eighth century, built during the glorious period of the Silla Dynasty and said to be one of the finest Buddhist shrines in the world. Inside, a white serene statue of a seated Buddha in a sublime state of enlightenment is surrounded by Bodhisattva, disciples and guardians. Both of BulguksaTemple and Seogulram Grotto are on the list of UNESCO world cultural heritage. Visit *Gyeongju National Museum, displaying the 23-ton Emille Bell cast in AD771 and thousands of priceless treasures. And transfer to *Cheomseongdae known as the world's oldest astronomical observatory built during Silla Dynasty. Have a dinner on your own and transfer to hotel. After Breakfast at your hotel and transfer to *Andong which is well-renowned for the home of the intellectual aristocratic class of Korean society and Confucius scholars during Joseon Dynasty(1392-1910), giving the aroma of traditional culture as the birth place of Hahoe masks,Chajeon games and Hahoe spirit rituals. Queen Elizabeth of United Kingdom visited here several years ago, marking it as a popular Int'l tourist attraction. *Andong Hahoe Village has preserved the housing architecture and the village structure of the Joseon dynasty. The village was not artificially created and still houses a small community of villagers. Three sides of Hahoe Village are surrounded by the Nakdonggang River. The village got its name from the way in which the river meanders throuhg it. Directly translated, Hahoe means 'spinning river' Next to Hahoe village are many pine trees and a soft sand plain, and across from it are beautiful cliff. In the late afternoon, you will get to have dinner on your own near Mt. Seorak Park. Have a dinner on your own and transfer to hotel. After breakfast and transfer to Mt.Seorak National Park, designated as a natural monument preservation area and as a Biosphere Preservation District by UNESCO. Seorak has been named because the snow would not melt for a long time keeping the rocks in a permanent state of white. The park is spread across 4 cities and counties : Sokcho, Inje, Goseong and Yangyang. The highest peak is Daecheongbong(1,708m), to the east is OeSeorak(outer Seorak) and to the west is NaeSeorak(inner Seorak), which is devided again into North naeseorak and South NaeSeorak. North NaeSeorak is composed of Bukcheon, which flows to Ingyecheon and Baekdamcheon. There are numerous valleys in NaeSeorak. Follow the Baekdamcheon valley where all the streams meet and you will reach Baekdamsa Temple. You will be transferred to take a cabel car to *Gwongeumseong Fortress” which is the site of a fortress ruins, located on the steep stone Mountain of Mt. Seoraksan. It is believed to have been built by the 23rd King of the Goryeo Period(918-1392), Gojong (1213-1259 reign). At the plateau of Gwongeumseong Castle there are 80 sections of rocks and you can see the East Sea and city of Sokcho. Also, to the west, you can see all kinds of fantastic rocks and stones which make up the Seoraksan Mountains. *Shinheungsa temple is a short walk away from the entrance. This temple used to be called Hyanseongsa built by Jajangyulsa(AD590~658), who traveled to famos mountains all over the nation during Queen jindeok's(?~654) of Silla Dynasty. It was destroyed and rebuilt many times since. On the path to Sinheungsa, there is a great bronze statue called Bronze Jwabul Staute, which is well over 10 meters high. Just beyond the statue on a granite terrace, there is a bridge to the right called Hyeonsugyo, which was newly built for crossing the ravine. Past the bridge there is a long stone wall with a Cheongwang door, and you can enter the temple. After looking around Mt. Seorak Park, transfer to *Goseong Unification Observatory (700m) built by an army unit in 1983 was the closest place from which you could view the Mt. Geumgangsan in North Korea before it was opened to South Koreans. The closest part of Mt. Geumgangsan is 16km away and the farthest part is about 25km away. After sightseeing Mt.Seorak and transfer to Seoul. This program will finish at Seoul Gangnam Express Terminal around 17:00. Tour guide will advise you how to get back to your hotel in Seoul. After breakfast at your hotel and free at leisure. Transfer to Incheon International Airport by airport limousine bus. Includes : Accommodation based on twin-sharing, seat-in-coach tours, admission fees, English speaking guide service, airport transfers by airport limousine bus. Not included : International air tickets, tipping and gratuity to driver and tour guide, any personal expenses and meals not specified in the itinerary. Remarks : Rates quoted in Canadian Dollars above are subject to change without prior notice due to currency exchange rate fluctuation. High season surcharge may be applied during the summer holidays (July/August), festivals, holidays and convention periods.